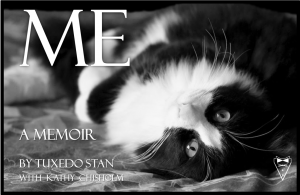 This is the memoir of Tuxedo Stan (2010 - 2013) written by Stan with some help from Kathy Chisholm. 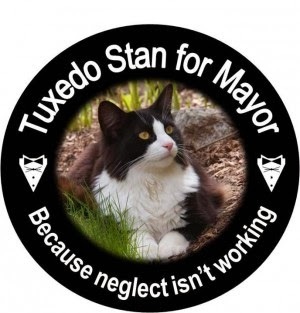 Stan was a kitty who ran for mayor in Halifax, Nova Scotia, in the October 2012 election. Anderson Cooper and Ellen DeGeneres publicly endorsed his candidacy. Alas, he couldn't legally register to run in the election because he didn't have a birth certificate. The movement was to highlight the need to spay and neuter the feline population in Halifax. Halifax has laws in place to ensure dogs are spayed and neutered but no such legislation exists for cats. All the money raised by Stan's campaign was spent fixing cats. Halifax city council provided a $40,000 grant to the local SPCA in Tuxedo Stan’s name in the months after the election to help establish a low cost spay and neuter clinic. 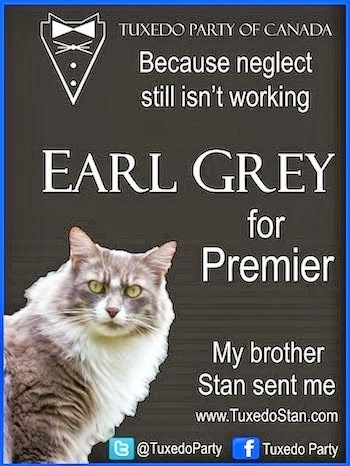 Since Tuxedo Stan's death in 2013, his brother, Earl Grey, has taken over as leader of the party and will be running for premier of the province. This book is super cute for all ages and tells Stan's story even before he was born. His mother, Greycie, had been abandoned and was living on the street. One day she was captured and taken to the vet for a check-up. That's when they discovered that Greycie was pregnant. There are lots and lots of colourful pictures. For a limited time, you can download the ebook (it's a pdf) for free ... just click here (I was able to downloaded it onto my Kobo Arc and my laptop). That sounds kind of cute!